Here's the most expensive iPad cover you'll probably never buy: iPad cover manufacturer Frederick James is selling a limited supply of tablet sheaths made from the pants of notorious Ponzi-schemer Bernard Madoff. The Madoff collection isn't designed for the mainstream consumer. Rather, it's a gag gift of sorts for overpaid Wall Street types with money to burn. Prices range from $250 for the Banana Republic Gavin Khaki Pants cover to $500 for the Murphy & Nye Sailmakers Pants . And, yes, certificates of authenticity are available upon request. Frederick James obtained the Madoff duds at a fall 2010 auction held by the US Marshals Service. The company specializes in creating luxury (i.e. expensive) iPad covers from "rescued fabrics," including materials originally designed for another purpose. 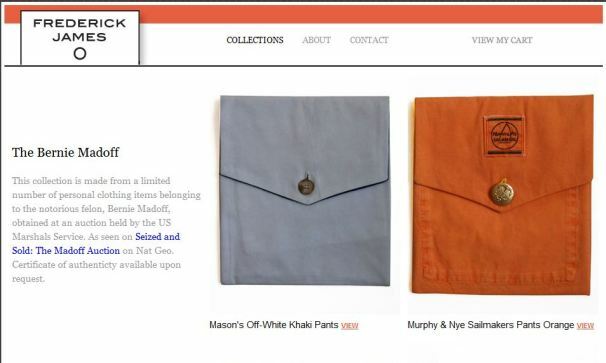 Frederick James founder John Vaccaro, a Web designer and developer, told Style.com the iPad cases made from Madoff's clothing have proven extremely popular. The first batch of Bernie covers, created from a navy Dior sweater and a Bergdorf Goodman sweater vest, sold out in a day, Style reports. Madoff, a former stockbroker, investment advisor, and non-executive chairman of NASDAQ, operated what may be the largest Ponzi scheme in history, in which he defrauded investors out of nearly $65 billion. He's currently serving a 150-year sentence at the Federal Correction Complex in Butner, North Carolina. Vaccaro says he hopes to make a donation to Madoff's victims once his company turns a profit.